It was time for a break – I decided to go and visit friends Kate and Lyn from Driftwood Dreamers who live at Opotiki. 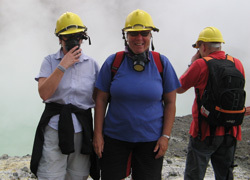 Driftwood Dreamers offer women’s tours in New Zealand – see their tours here. On the way I picked up a friend Linda in Rotorua where I have not been for years. 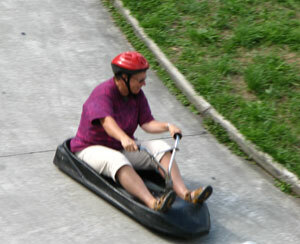 The one thing I had always wanted to do in Rotorua was to go on the Luge, and on the spur of the moment decided I had to do it. I tentatively bought a five ride ticket (an absolute minimum I decided by the time I finished) and donned a helmet (did I really need this??). One of the assistants Huriana, spotted me as a novice and gave me a few pointers and suggested the Scenic Route. I was off – this was amazing. Next time it had to be the Intermediate route, and second time down this route I was really going for it and not using the brake much at all. Each time a chair lift returned us to the top to start again. When the Mataatua canoe landed near the site of present-day Whakat?ne, the men went ashore. While they were gone, the canoe began to drift out to sea. Ng?ti Awa tradition says that Wairaka, daughter of the captain Toroa, seized a paddle and cried, ‘Me whakat?ne au i ahau nei!’ (I must act like a man!). She and the other women saved the canoe. 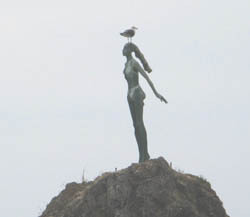 Wairaka is now commemorated by a statue on a rock at Whakatane at the entrance to the harbour. We took this photo of Wairaka on our way out to White Island, one of New Zealand’s active (and I mean ACTIVE!) volcanoes. We went out with Pee Jay’s tours, motoring out past Whale Island the haze burnt off and blue sky appeared. White Island appeared with steam billowing out – its 27 kms from the mainland. We were only minutes onto the Island at our first stop before I started coughing and spluttering – most of us quickly donned our gas masks – Rotorua has nothing on this smell – it is evil and noxious. All around us were mounds of yellow and white and we were warned to keep to the tracks as these were just a thin crust over boiling thermal waters. The guide gave us lots of great information at we were led eventually by an easy walk, right up to the rim of the crater. Afterwards back on the boat we were served lunch and offered a swim before heading off for a cruise around the Island. There were thousands of young gannets sitting on the cliff flapping their wings practising for their first flight — to Australia! We were on dolphin watch and were not disappointed as two ‘common’ dolphins appeared. After that we felt we could relax and most did – there was barely anyone awake for the quiet ride home.